On Monday I was arrested along with many other people in the street in front of the U.S. Capitol, participating in the new Poor People’s Campaign, the first multi-issue coalition we’ve seen in years that properly takes on militarism rather than indulging the fantasy of a $1 trillion a year military coexisting with decent humanitarian and environmental policies. Yet it was hard at this peaceful gathering and in the “training” before it not to notice people’s habitual shouts of “fight back!” and “go to war!” and “we must be warriors!” — not to mention the handing out of U.S. flags. What bothers me far more than peace activists talking war talk, however, is war activists talking peace talk. I recently debated a “military ethicist” who literally claimed to support wars out of love. The Pentagon, of course, has a peace pole in it. While no peace activists ever claim that peace will help bring the world to a state of war, war activists are constantly claiming that war will produce peace — in fact they’ve been doing so for 100 years now in the face of ever growing evidence to the contrary. On Thursday, the department formerly known as the U.S. War Department posted this headline: “Army Leader Focuses on Empathy, Compassion.” The article made no mention whatsoever of “humanitarian” propaganda, of how to pretend that massive violence and slaughter can be used to prevent greater suffering. It included no comment on winning the “hearts and minds” of the people you are killing and occupying. It suggested no techniques for properly empathizing with those you kill or injure or torture or render homeless or force to obey foreign or domestic tyrants. The War Department article focused entirely on how a U.S. military commander can empathetically and compassionately command subordinates to engage in the mass killing of which war consists. There’s no mention of the fact that U.S. veterans are much more likely to commit suicide, or the fact that they are much more likely to go on committing murder beyond the permitted times and places. In fact, there’s actually no mention at all of any ways in which to be empathetic or compassionate even to subordinate soldiers. The obvious first steps of allowing “volunteers” to stop volunteering, of providing non-evil career options, of investing a few percent of the military budget in making college free, of firing John Bolton before he blows up Korea and the rest of us with it, etc., would clearly not be acceptable. But nothing else is offered instead. So, what’s in the article? Virtually nothing. We’re told to use something called “hard leadership,” but not what it is or why it’s called that, or why it has to be called something that makes it sound cartoonishly and barbarically stupid. The article fully exhausts its vocabulary in avoiding saying anything, to the point where it is reduced to telling us that there are “many lessons on the hard things of leadership,” but neither what those lessons are, nor what those hard things are. 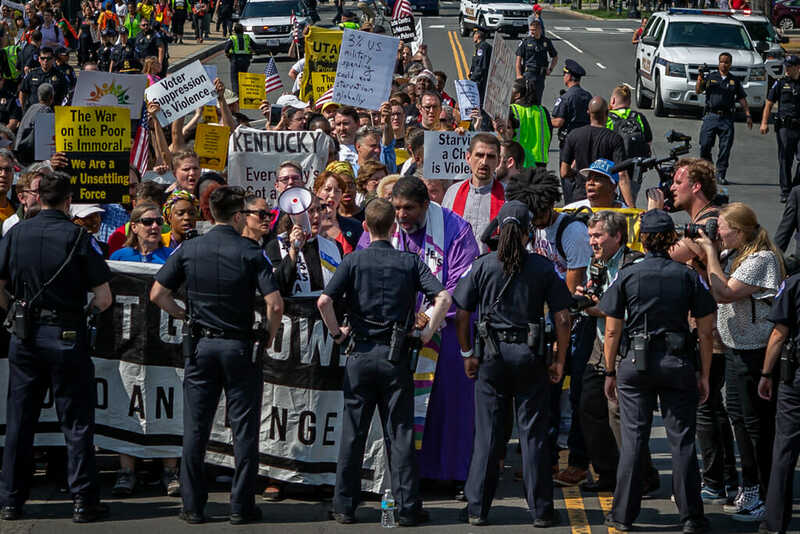 Nonviolent activists filling the streets for peace and justice are doing so at the risk of going to jail. Violent soldiers bombing and shooting up distant streets are doing so lest they be sent to jail for refusing. One of these movements is a place for great leaders. The other is a place where leadership is more than “hard,” it’s impossible. Back in the day when the IRS had actual human beings working for it and not just computers, I had an employee actually come visit me to negotiate with my resistance. He told me that ‘Income tax is a form of love.’ For some reason from that statement I’ve always pictured a hydrogen bomb going off and vaporize into a sort of oneness; is that what he meant? The US government is a profoundly criminal entity. Back in the day when the IRS had actual human beings working for it and not just computers, I had an employee actually come visit me to negotiate with my resistance. He told me that ‘Income tax is a form of love.’ For some reason from that statement I’ve always pictured a hydrogen bomb going off and vaporizing all life into a sort of oneness; is that what he meant? The US government is a profoundly criminal entity. Isn’t”War is Love” an oxymoron?